LatinaLista — If anyone out walking in the Tucson desert last week thought they saw a white object gliding silently across the Arizona sky, they can be forgiven for thinking it was a UFO. It wasn’t but it was something never before seen, maybe anywhere, in the U.S. It was a 800-pound paper airplane. 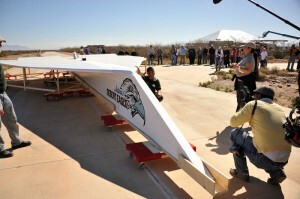 The 45-foot paper plane was the culmination of a contest sponsored by the Pima Air & Space Museum’s The Great Paper Airplane Project. Wanting to encourage kids to go into math, engineering and science, the museum invited kids back in January from the Tucson area to go to the museum and fly paper airplanes that they had made. 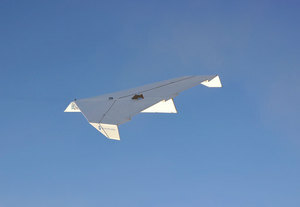 Each child, ages 6-14, had only one sheet of 8.5 x 11″ paper to fold into the design they thought would fly their plane the farthest. 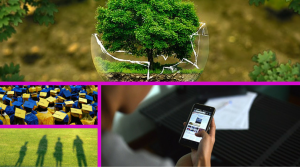 Arturo Valdenegro, a 12-year-old seventh grader from Santa Cruz Catholic School in Tucson, developed the winning concept. Experimenting with different designs, he was able to get his paper plane to fly 75 feet — beating out the 150 other kids who had entered the contest. 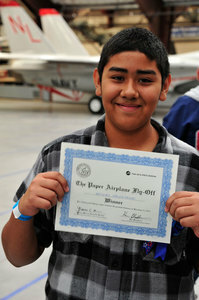 While everybody who entered the contest won a free family membership to the museum, Arturo’s winnings is making him a part of aviation history (according to the museum). Arturo’s design was scaled up, way up into the 45-foot model. Arturo got to help with the designing process and flew to Los Angeles to work with the design team, some who had worked with NASA and the U.S. Air Force. After a few rough starts — it was a little heavier than anticipated — the paper plane was hoisted into the air by a helicopter which released it over the desert — flying it into aviation history before it crashed and suffered extensive damage. However, the plane achieved something else even more important — it inspired Arturo to think about going into engineering. Previous Post Tomb of Atahualpa Found?